I actually am glad that most Calvinists are inconsistent enough not to say the above things. The less their doctrine is spread, the better. The less their doctrine is spread, the less people will be turned away from Christianity and become Atheists. 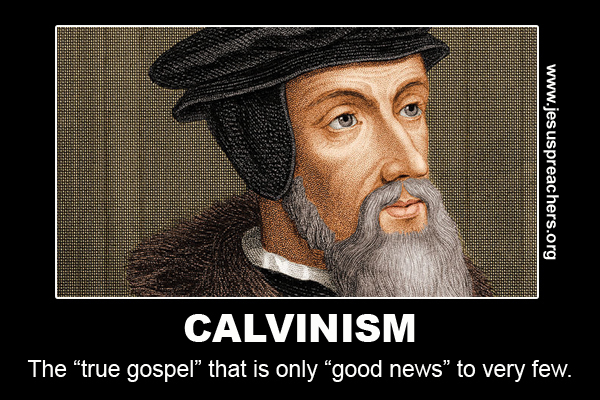 If you are a Calvinist, then you need to either become consistent or give up your false doctrine. Why don’t you preach your beliefs on the street? Why don’t you share these things in witnessing encounters? Why don’t you tell little children, babies and the parents of such children/babies, the truth? Why don’t you incorporate your doctrines into your prayers? Is it because you don’t really believe what you say you believe? Is it because you are scared to share them? Is it because you know that they don’t make any sense and that you have no logical defense for them? Is it because you have no Biblical defense for your doctrines? You truly have no excuse. If you are right, concerning your theology, you will give an account to your “god” on judgment day, for being ashamed and for not sharing the whole truth (<–Yes, I know, that doesn’t make any sense, since he decreed you to not share your beliefs). If you are wrong, concerning your theology, you will give an account to God for believing it, teaching it and spreading it, since it is false doctrine. Either way, you need to repent. I pray that you come to the latter conclusion. This entry was posted in Calvinism, Theology and tagged calvinism, consistent calvinism, false doctrine, false teaching, heresy, heretical, Irresistible Grace, james white, jesse morrell, John MacArthur, John Piper, kerrigan skelly, Limited Atonement, Paul Washer, perseverance of the saints, PinPoint Evangelism, R.C. Sproul, refuting Calvinism, T.U.L.I.P., Total Depravity, Unconditional Election by Kerrigan Skelly. Bookmark the permalink. Hey Kerrigan i have a question on eternal security? I watched ur probation and final salvation videos their a blessing to me their awesome,God brought me to it! and you have the correct biblical standpoint on conditional security. But Kerrigan if a true christian happens to say a dirty word like the F Word or B word once in awhile either to themselves or another person should they repent and confess that sin to God? Are they in danger of going to Hell if they dont repent of that sin? Do curse words put your salvation in jeapordy, do they cost you your salvation?? Hey Kerrigan i have a question on eternal security? Yea i watched ur videos on probation and final salvation they were a blessing and very helpful! God brought me to ur videos, you preach the correct and most biblical standpoint on conditional security! But Kerrigan if a True Christian happens to say a dirty word like the F Word or B Word or even the S word every once in awhile either to themselves or another person are they supposed to repent and confess that sin to God? If they dont repent and confess that sin to God are they in danger of going to Hell?? Do curse words put your salvation in jeopardy? Do curse words cost you your salvation Kerrigan? My family and I have been visiting a Reformed church locally. As I have read more and more Calvinist books and listened to the Pastor along with Sproul, Lawson and other Calvinist celebs I find it very confusing. They always seem defensive arguing in semantics. I agree with God’s sovereignty but man’s choice to accept or reject as well. If I say something outside the Calvinist line of thought I am told that is a fist of defiance to God. I would find witnessing with the tulip to be impossible. Unbelivers might think, is this a cult? Great article! This is ridiculous. A caricature. I see no evidence that you actually understand what Calvinism teaches. Very sad. Thanks for posting the link. You say in that blog: “There are some Calvinists who have studied Calvinism and know what it teaches.” This is where I see myself. When I say “Calvinism”, I am not talking strictly about what John Calvin taught, but rather the theology as understood in the acronym TULIP – the theology you are critiquing. That is where my comment was directed. I highly doubt that anyone who has studied Calvinism and knows what it teaches (according to your definition) would agree with your presentation of it. For example, your #8 above – that a consistent Calvinist would say “There’s no reason for me to go out witnessing tonight.” Neither a fair nor accurate portrayal, and no serious Calvinist would agree with it. And given your non-response to me, I sense that you know I’m right…which makes me wonder why you post misleading information on your blog. Like I said, it’s very sad to see “fellow believes” caricaturing what they disagree with. Very sad indeed. My non-response? LOL. It’s not as it I sit around all day waiting for people to respond to me and respond back. I have a very busy life. Maybe you should just exercise more patience? I have not given a “caricature” of anything. TULIP is based upon what Calvin taught. If you don’t hold to what Calvin taught, then how can you call yourself a “Calvinist”? If you don’t agree with what Calvin taught, then maybe you should refute it. But hey, what can I do? If Calvinism is true, then the “god” of Calvinism predestined me to write this blog post. I couldn’t have done otherwise. Who are you, oh man, to reply against God? I’m just a “piece of clay” on the “potter’s hand”, right? Why are you acting like I have free will? I was just noting that it took you 16 minutes to respond to me the first time, and then I heard nothing for 5 days. BUT…you are right. I could be more patient. My apologies. TULIP…doctrines of grace….whatever we call it, refers to a specific set of beliefs regarding soteriology. Calvin didn’t come up with the acronym and I’m not talking about him specifically, even though his name is now part and parcel with TULIP. So let me focus on 21st century Calvinism (we both know what I’m referring to) and not John Calvin. According to the Oxford English Dictionary, “caricature” is defined as follows: “A picture, description, or imitation of a person in which certain striking characteristics are exaggerated.” This is what you have done with Calvinism, hence my taking issue with your blog post. Let me be fair: not all 10 points you listed are offenders. Numbers 1 & 5 would be examples. I agree with the content of what you have written, though the callousness that you portray the Calvinist demonstrating is a cheap shot (also seen in number 6…seriously Kerrigan?) But other points you make are very problematic. I have already addressed number 8 (which you did not respond to) and number 4 as well….only Calvinists can use logic?? You have not demonstrated serious knowledge of what Calvinists (like myself) actually believe, nor concern with an accurate portrayal. Instead, you present “consistent” Calvinists as heartless, uncaring, cruel and indifferent. Your post, though accurate on several points, also reeks of ad hominem and straw men. This is hardly a God-centered approach. I’ll go even farther – I think this is sinful. Misrepresentation and distortion have no place in Christian apologetics, especially regarding in-house discussions between professing believers. I have made it very clear what kind of “Calvinism” I am coming against. I have probably dialogued with more Calvinists than you know. I’ve probably read more books by Calvinists, watched more videos by Calvinists and listened to more teachings/sermons by Calvinist that MOST people who call themselves “Calvinists”, including you. It seems for me to believe that Kerry skelly opinion is more soverign than Gods. What about the flood, unborn newborns and children all died, totally obliterated off the face of the planet, but God loved them dearly, I’m confused, people say that’s the old testament, I did nt know God changed. How can we pray for someone who has rejected God? If I pray for that person to be saved, God would have to intervene, then that’s not free will. You’re all over the place. First of all, it’s nonsense to accuse me of thinking that my opinion is more sovereign than God’s. I would never say or even imply such a thing. Only a Calvinist would even think to accuse me of that. What I believe comes from God’s Word. Death does not necessarily mean that someone is being punished. God doesn’t love anyone who dies? I don’t think that God has changed at all. He is the same yesterday, today and forever. How can we pray for the lost? It’s simple, you just love them enough to ask just to influence them to salvation. Free will doesn’t mean the absence of influence to do right or wrong. Free will is the ability to choose which influence you will give into. What about them? You seem to assume that death is always bad or always a punishment from God or something. Hey Kerrigan, what if I told you that I’ve said nearly all of the things you listed above? The only things I haven’t said are the comments to children and the comment about evangelism. The reason why I haven’t said the comment about children is because I don’t have any yet, and a child can be “cute” while still being totally depraved. The great commission is a command, so I obey it, and let God do the saving. I also don’t “thank” God after I sin, but I do acknowledge that He is sovereign over it and restrains the sin that I would normally commit. I am not ashamed of the gospel. What will God do to me for being “consistent”? Punish me for hypocrisy? If you truly are a consistent Calvinist, then I’d tell you that you are an idolater who needs to repent of your idolatry. Your God doesn’t exist, except in your skewed theological system. You don’t worship or serve the God of the Bible. Thank you so much for this article. Yes, I laughed, but no, it’s not really funny. But all of it is true. Hi Kerrigan, can you tell me where you are preaching in the photo above? Also, I wanted to say it’s really sad that the person you replied to above, Carlin, admits to having actually said those things to people. And it’s refreshing that you call things like they are instead of dancing theologically with Calvinists. Have you read Rachael Slick’s testimony? She is Matt Slick’s daughter. She is an atheist now. In her testimony, she describes her upbringing. It’s clear that what Matt Slick really worships is winning debates. Rachael talks about the time in college when her faith in the Bible fell flat. This reminds me of my own Calvinist up-bringing, and what I still find in Calvinist circles: that people are more interested in believing in and defending the Bible (i.e. their false understanding of it) than believing in and following Jesus Himself. The whole culture revolves around their Bible knowledge and debating their positions with others. And since they are never taught that it is up to them to choose to trust and follow Jesus, I’m not sure that some of them have ever really known Him at all. They trust in their theology. Not in Jesus Himself. So disturbing. Hey Deborah. The pictures change each time you change pages or refresh the page you are on. I would need a description of the picture to answer the question accurately. Amen! I love Calvinists, so I must tell them the truth. No, I’ve never read Rachel Slick’s testimony. It wouldn’t surprise me if what she is saying is true. Intellectual pride is one of the major problems I’ve seen many Calvinists have. However, take her testimony with a “grain of salt.” She is not a believer, so there’s no telling what “truth” she will stretch in order to make Christianity look bad and atheism look good. Blessings! In the photo, you have a green plaid shirt on. Looks like you are at a university? 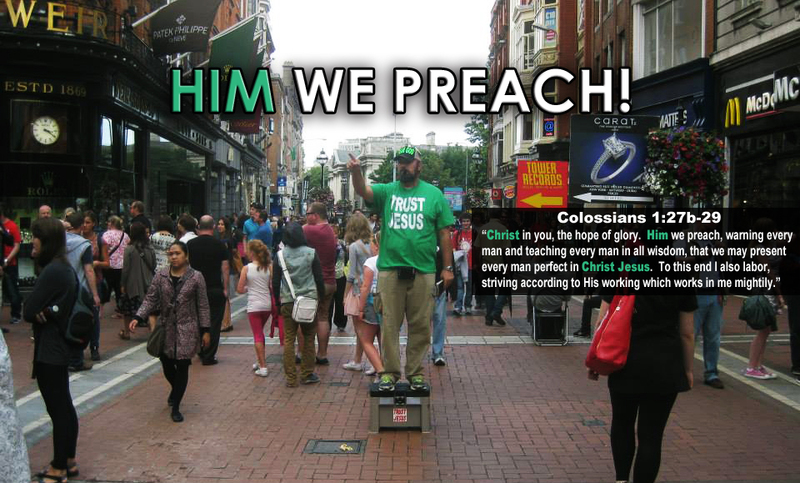 Do you often do “open air” preaching like that? Re: Rachael, that’s true, thanks. I brought it up because I was raised in a Calvinist setting — the whole town, in fact (very few non-Calvinists in Pella, IA) — and what Rachael is describing rings true to me, since I’ve witnessed those types of things. I haven’t read much of your blog, but it looks like you are on to something God started showing me while attending a very Calvinist church here in MO — that once we are baptized and claim to be Christians, we can’t go around sinning like it’s no big deal. We are saved from sin, and we are to be the light of the world through holy living. Unfortunately, what I found in the really conservative Calvinist church we were attending was that the present sin in our lives was no big deal because Jesus had already covered our sins, past and future, and that He would be glorified as merciful in the end for forgiving all of them. I just couldn’t buy that in light of the New Testament’s urging statements that we must continue to live holy lives, and that drinking from the Rock, Christ, in the past, doesn’t guarantee that we will follow Him in the future. We can’t have that false assurance. Yes, Christ will never leave us, so there’s no reason to fear. But we have to hold up our end of the bargain. Yes, I open air preach at many universities, during the Fall and Spring semesters. AMEN! We must live holy lives if we’re going to claim to be Christians.